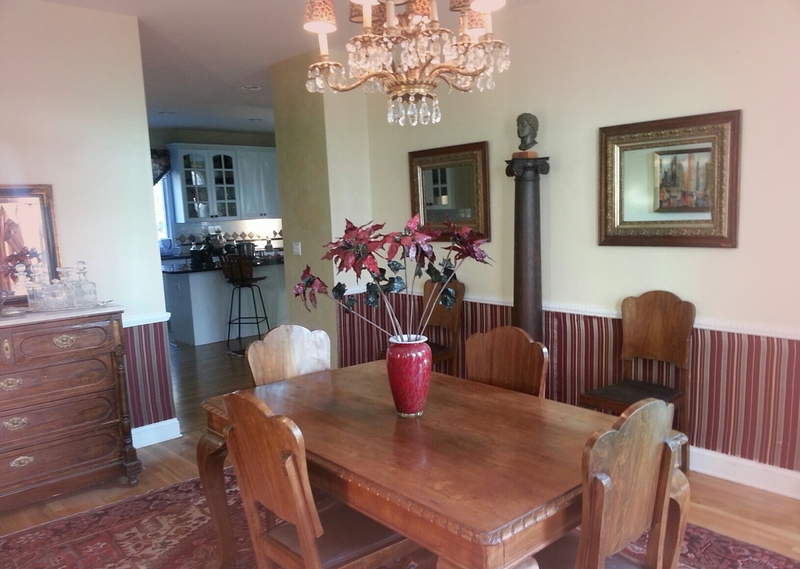 Give a Room a Glamorous Make-Over for 10 Dollars! Got this look for under 10 dollars! I am what you might call a perfectionist. I always have been. I also have what is known as champagne taste and again, that has always been the case. You know what I mean. I like the finer things. I just can’t help that. So my house has always looked very chic and I am incredible attentive to details. There have been many times in my life, however, when this girl’s champagne tastes were put on a beer budget, if you catch my drift. When I was the young wife of a military captain our budget was tiny. When we moved on base I was, how to put this nicely, miserable! when I saw the house that was to be my home for the next year. Everything was 20 years out of date. Burnt orange and avocado green (which really looks like avocados gone bad) ruled the kitchen. Not only did we not have the money to invest in much decor, but we had to sign a contract not to permanently change a thing about the 1960’s dream house. I signed the contract and I kept my end of the bargain, but it didn’t look like it! I knew that I couldn’t live in this house as was for an entire year and I knew that new curtains weren’t going to fix the color problem. SO! What was a broke, young champagne taste to do? FABRIC! Yes, fabric always pulls through for me. I bought an inexpensive through rug, black and white, for the floor and bought Donna Karen sheets, black and white checked, for the walls. Just listen, I know it sounds crazy, but I wallpapered with liquid starch and fabric for a very chic, very fun, commitment free wall paper! So a rug, some sheets, and oh yeah! Black contact paper for the orange counters. It didn’t look exactly like granite, but trust me, solid black was a significant improvement. When people saw my house their first reaction was exclaiming just how much trouble I would be in for the changes I made! It looked like a completely different house. When we moved, though, I simply grabbed the fabric from a corner, tugged and voila! back to the ugly walls they were so insistent I should have. So! All of this to say, I’ve been decorating my house. I’ve been wanting to give my house a little do-over for some time. This time, though I spent less than I did 30 years ago! Granted, I had a lot of the materials laying around. Fabric is the main expense here and fabric I have plenty of. Yes, it went up on the walls again and I’m happy to say it looks amazing. I’m not a hoarder by any means. I hate clutter, but I never toss away good fabric and I’m glad! 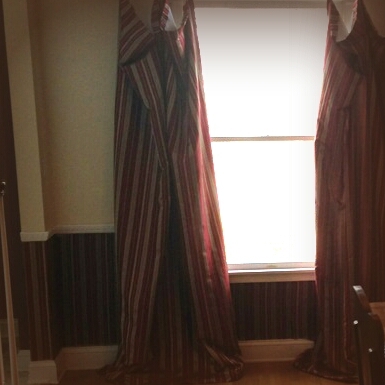 The room I “wall-papered” this time was the dining room and I chose the same fabric for the walls and the drapes. The fact that they match automatically makes it look expensive. Pleased with the way it turned out! Chose fabric that goes with your room. If you have a rug, pull colors from that. My dining room rug has hints of gold, burgandy and cream, so naturally when I found my fabric that had gold, cream and burgundy stripes I was sold. Chose fabric with a geometric pattern. 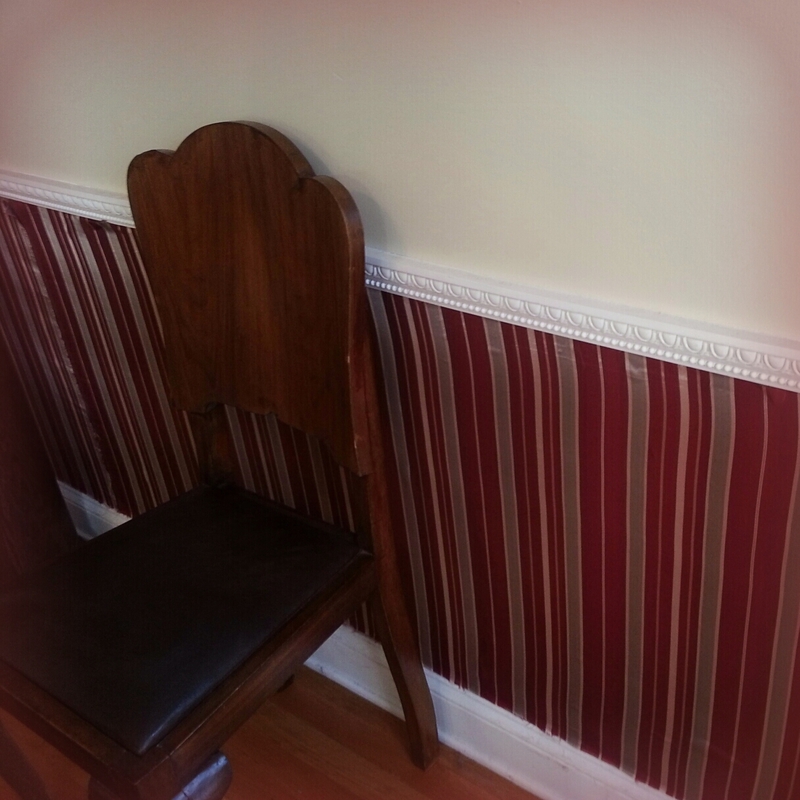 Just like with wallpaper you want to make the seams, well, seamless. It’s easiest to match up something like stripes, checks or plaids rather than a floral or animal print. Measure as you go. Measure and re-measure. You’ll need to know the exact amount of wall you want covered and make sure you have enough fabric to cover the whole thing. Remove all light and socket plated for the are you are working with. You’ll need a good Exact-o knife to cut out those areas and to edge your work. Fill a basin with with liquid starch. You’ll need a smaller container of plain water handy. Measure again! Better to be on the safe side! Start at a corner and line up the fabric with the wall being sure to keep the pattern straight. Smooth starched fabric over the wall with the water damp sponge and you will see that the mixture of starch and water acts like a glue. Use the sponge to spread and smooth as you go, working the fabric with your hands to keep the pattern strait and the fabric wrinkle free. 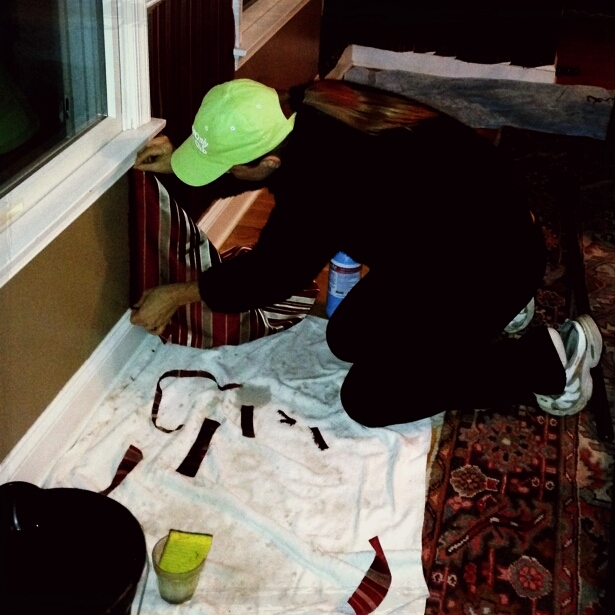 Once wall is covered and fabric is dry, edge with your knife to get clean lines and corners. This sounds complicated, but it’s not. It’s really a whole lot of fun! I can’t tell you how pleased I am – yet again – with this old reliable technique I’ve had up my sleeve for so long. It really looks fabulous, glamorous and expensive and I literally spent less than 10 dollars on the whole room! I should warn you that the process is a bit rough on the hands, so I might tack the cost of a manicure onto that bill, but really! For Christmas I’ll use some of the burgundy ribbon I have packed away to accent some points of the room. So, if you’re hosting for the holidays and want to give a room a 1-day makeover, try this beer budget trick! It’s sure to impress even the finest champagne tastes out there! Use hands and sponge to smooth fabric as you go. « Which is Healthier? Green or Red Apples?